Marc Jacobs handbags are known to be roomy and accessible, they come in a great range of colors with subtle but striking details. Though a high majority of handbags are sold in a range of price from $300 to $800, celebrities do appreciate Marc Jacobs handbags (Uma Thurman, Drew Barrymore, Sarah Jessica Parker I’m sure they pay much more than 3-800 bucks a handbag). 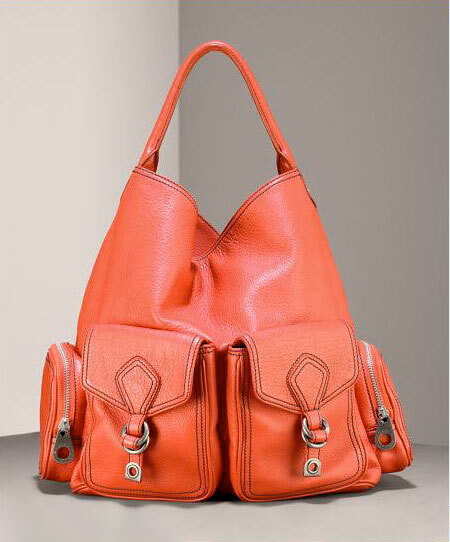 Well anyway, after the short introduction, I give you this joyfully colored handbag from Marc Jacobs. It is, indeed, very roomy and accessible with the front buckle pockets and zipped ones on the sides and the details such as black topstitching , silver buckles and zippers. It’s one of those handbags that cost $398, so we won’t seen it toted by heavy celebrities. Rejoice, you’ll be one of a kind!